The Kids Against Hunger meals have been formulated by food scientists to provide a rich source of easily digestible protein, carbohydrates, and vitamins needed by a malnourished child’s and adult’s body and mind. The food also accommodates to the broad diversity of ethnic tastes and religious differences around the world. 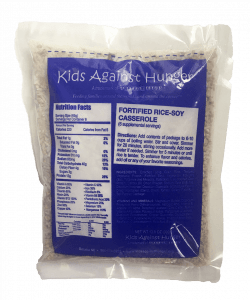 Kids Against Hunger’s meals offer all nine of the essential amino acids required for complete nutrition – something that can’t be said about other typical food relief sources such as rice or beans alone. For individuals with special dietary restrictions our international and domestic food is gluten free and vegan. The vitamin formula is a proprietary formula and is the “secret sauce” that goes into our food. It includes 21 vitamins and minerals, and each bag of our food contains six servings of the dehydrated food which when boiled will feed six children or adults. According to the food scientists developing the food, it supplies the optimum amount of nutrition for a malnourished individual. It provides not just a meal, but better health to starving people. Additionally, our bags are specifically made from moisture-proof and odor-proof material to prevent spoilage and insect or rodent problems. The food bags are also three-ply for strength. Kids Against Hunger’s life-saving meals have a shelf life of at least three years. Latin Rice will find its place as our premier domestic aid product. Its unique packaging, bold flavor, and high nutrients will hopefully make it more than just an aid for hungry families. We hope to see it as a symbol of reversing the course of hunger in America. All together there is 18 vitamins and minerals and 9 amino acids that can serve up to six people with just 6 cups of boiling water. It comes in a fantastic new package that is moisture-proof and odor-proof to prevent spoilage as well as insect and rodent problems. 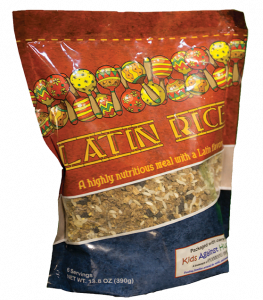 The Latin Rice, with its flavor and richer texture, also passes the Federal School Lunch requirement. The collaborative partnership with Conagra Brands and its employees was essential in creating this winning formula of Latin Rice, a beneficial asset in our fight against hunger here in the United States.